February 2015 is the beginning of the year of the Yin Wood Goat and begins on the 4th February. I would recommend taking a look at the Annual Chinese Animal Predictions and Annual Flying Star Analysis as this will help a lot in 2015 to make the year as successful as it can be. To view one of the articles, click the links below; the page will open in a new window so you wont lose this page. From 4th February to 5th March 2015 is the first month of the Yi Wei year (Yin Wood Goat year) with the ruling energy of #5 in the central grid. Northeast –This is a lovely combination in February and brings good career and reputation when activated correctly; this is overall, a very nice combination and welcomed to the northeast this month. You should place real quartz crystals here to activate or ceramics or any other earth object or shape. This is also where you place the Golden Pi Yao and Zhao Cai Jin Bao Protection Amulet for the Annual Cures in the northeast for 2015. Good colours to use in the northeast in this month are earth colours such as yellow, brown or beige. This is an excellent place to have Amethyst crystal or other quartz crystal. North –This is a lovely combination between the monthly and annual stars this February and when present in the right environment, this can become a fantastic wealth area. If you have a 3-legged Toad, this is an ideal place to place him in February 2015. This area is ideal as an office or a room that has much activity such as a living room or play room although if you have a bedroom in the north this month, you should try to keep it quiet. If this combination falls into an area that is an office, you should try to leave the window open as much as possible and activate the area with noise like a radio. A very good cure here is a wind chime that is made from real quartz crystal or anything that is made from the earth element like ceramic or terracotta. Outside enhancers are anything that moves with the wind like a whirligig. If you are using the Annual Cures and Enhancers, this is where you would place your Ba Gua Fu Pai Master cure and Shuang chong li yu Double Carp as of the 4th February 2015. Centre –The centre in February is not favourable to health or financial issues, although, if this area is a bathroom, utility or similar less important room it is not a problem. If the centre of your home is a bedroom or kitchen there is risk of liver problems, limb or blood infections and also finance issues, if this area is an office or lounge it can cause financial problems relating to taking risks like stocks and shares or gambling. Please be aware of all of these this month and take precautions accordingly. A good cure for the centre this month is to place a brass table lamp with a red shade or a red bulb. If you are using the Annual Cures and Enhancers, this is where you will put the Pai nan Jie Fen Talisman Red Tassel. If the centre of your home is present in a bedroom, try and face your Tien Yi or Yan Nien directions and try to keep the room as quiet as possible. Another option is also introducing fire element related colours like red, pink or purple combined with metal element related colours like white, silver, gold or copper. West –This combination of the monthly #7 and the Annual #5 yellow when combined with the three killings causes squabbling and back stabbing and can also cause financial problems especially if you have a main door here. Keep this area very quiet as much as you possibly can; if you have a childs bedroom in the west, try to keep this area very calm. If the west is in an area that is an office, use blue objects such as a blue rug. 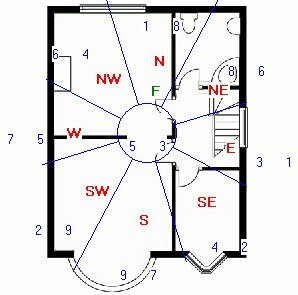 If this combination falls into an area that is a bedroom try and face your Tien Yi or Yan Nien directions which you can find out by using the Academy of Feng Shui software. You should use a salt water cure here If the west is an important room like a bedroom, lounge, kitchen etc and if you use the Annual Cures and Enhancers, this is where you would place your 6 Metal rod wind chime, 6 Chinese I-Ching coins tied in a row and Salt Water cure. Good colours to use in the west in February are metal colours white, silver, gold or copper; you can also use water colours blue or black to dissipate the energy of the #5 star. Avoid candles or fire colours like red, pink, purple, orange or burgundy in this area. Southwest –The southwest comes with its problems in February although there are still good sides to this area. You should make sure that this area is bright to balance the yin influence of these two trigrams as it can cause many problems. You should introduce metal cures like six Chinese coins in a row tied with red ribbon and/or a Wu Lou to weaken the influence of this month. 9 Purple is the star of future wealth and has an auspicious influence in Period 8. Career opportunities and promotions are probable especially if you have an office or main door located here. There is fame and acknowledgement, growth and improvement. If you are using the Annual Cures and Enhancers, this is where you place the gao qian Three i-ching coins with mystic knot and tassel. If your front door is located in the southwest, this is very good and you should activate this area with water plants such as indoor bamboo etc or even a water feature although I would only do this if you have had a Feng Shui Consultant advise this. You should use a salt water cure if it is an important room like a bedroom, lounge, kitchen etc. Northwest –This combination is not a favourable influence for relationships and can cause heartaches especially for the females in this household. If you are pregnant, you should try to avoid this area in February if possible. Although not favourable for relationships, there are upsides to the northwest in February. For the northwest, you should introduce water colours like blue or black especially if this is a bedroom. If you are using the Annual Cures and Enhancers, this where you will place the Ba Ying Fu Pai Eight pearl Talisman Wish & romance enhancer as of the 4th February 2015. If you have Mandarin ducks them in the northwest this month to enhance relationships. If you have a family, place family photos here along with family symbolic objects like a statue/painting of a family etc. You should avoid placing too many heavy metal objects/ornaments or using the colours white, silver gold or copper as these are metal colours and cause much conflict and possible injuries to the lower body. With the wood of the #4 star combined with the #6 metal star it can cause problems with the skin and if this is a bedroom introduce same dark blue colours. East –You should make sure that there is no tall or heavy furniture in this sector of your home or office this month. You should also leave the door or windows open as often as security and climate will allow you to do so throughout February although I won’t be sticking to this one too much as February is looking to be very cold in the UK this year. During February, it is a good idea to introduce some fire element related colours such as red, pink or purple to weaken the monthly influence of the #3 star. You should try to keep the east of your home or office as bright, open and as clutter free as you possibly can this month. If your bedroom is located here, it is advised that you place some fire cures in the east such as candles (with care) or fire colours like red. If this area is a bedroom try and keep windows closed when possible or if it is an office/lounge/kitchen keep the windows open but only if security and climate will allow you. Place a Ba Gua wealth protection mirror in this area outside if you have any poison arrows outside directed at this area. If you are using the Annual Cures and Enhancers, this is where you will place the jù bǎo pén Yuan Bao wealth ingot and the Sheng Chi Cure for 2015. Good colours to use in the east this month are water colours like all shades of blue, grey, charcoal or blacks or combinations with white, silver, gold or copper. Do not use earth colours yellow, brown, beige or greens. You can introduce these colours in bedding, throws, lampshades, pillow covers etc. Southeast –This combination is not the worst match but does have the possibility to cause stomach problems and problems with the mind so please remain aware of this throughout February. A nice and simple cure for the southeast in February is to place tall furniture in this area and also place six Chinese coins in a row which should be in place for the year for the Annual #2 star along with your Salt water Cure and Jin Se Da Xiang Jewelled Elephant. You should try to keep windows or doors closed as much as possible. You should also try to keep the southeast as calm and peaceful as possible. For the southeast in February, I would try to introduce some deep blue colours here; an easy way to do this is by using bed covers, rugs or wall coverings. Good colours to use in the southeast are metal colours white, silver, gold or copper or water colours blue or black. South –This is not a good area for February 2015 as we have the annual influence from the #7 metal robbery star and this month, we will see the monthly #9 fire star which is auspicious in period 8 (2004 – 2024) although this combination is known as fire burning heaven gate and the results can cause some problems if some careful steps are not taken. A fantastic cure for this area in February is placing a bowl of Yin water which is essentially a bowl of still water which is replaced every few days. You should place this from the 4th February 2015 and should aim to change this twice a week until the 5th March 2015. If you are using the 2015 Annual Cures, you would place you Fo Xiu protection Buddha here on the 4th February and also your Yao chan wan guan Wealth Protection script to help alleviate problems from the annual influence of the #7 Flying Star. When these two Flying Stars meet in the same sector, fire risks are vaguely present for the duration of the month so please take precautions in this area in February as although it is not certain, the risk is still there and avoidance is usually the best cure so be sure to check smoke alarms. It is a good idea to introduce blue and black shades and also images of still water if you can and even better with a mountain in the background although you should not place any images of waterfalls, waves or any moving water and also be sure to remove a water feature or fish tank for the month if it is located in the south.